Lawyers for the People’s Progressive Party (PPP) candidate in the Whim/Bloomfield Local Authority Area have appealed a High Court decision that there was no evidence to prove that the Alliance For Change (AFC) had fooled backers to endorse its candidates. “That the decision of the Learned Hearing Judge be reversed, set aside, vacated and that this Honourable Court gives clear guidance on the legal principles raised in this Appeal for future conduct of Local Government Elections,” states the papers filed with the Court of Appeal. That decision by High Court Judge, Navindra Singh, based on a police report from an investigation he had ordered, essentially means that the AFC candidates would not be removed although many of the backers had issued affidavits that they had been misled into signing papers. The court has found there was no evidence of “fraud, trickery or threat” to force any of the nominators to sign as backers for AFC candidates and so there was no basis to ask the Chief Elections Officer, Keith Lowenfield to strike out the names of the backers. Shafraz Beekham, of Letter Kenny Village, Corentyne, on behalf of himself and 49 others, had sought to convince the court that they had been “misled/deceived” by an AFC representative into signing as a “nominator/supporter” of candidate, Orlando Christopher Persaud. Assuming but not admitting that the police report was based upon and constituted admissible and credible evidence upon which Judge arrived at his decision, the PPP lawyers said the judge failed “to take into account and gave appropriate weight to over twelve (12) assertions in the said Report which lend to the clear inference or conclusion” in several areas. They are that persons whose signatures appeared as nominators of candidates for the Alliance For Change in the Whim/Bloomfield Local Authority Area did not understand the nature and purport of the documents which they signed; those who procured these signatures did so by misrepresenting themselves as representatives of the Guyana Elections Commission or persons associate with the People’s Progressive Party Civic and those who procured these signatures did so by misrepresenting the nature and purport of the documents for which they were soliciting the signatures. The lawyers also cited various forms of inducements were offered in the solicitation of the signatures of these persons; none of the persons procuring these signatures explained or even attempted to explain to the persons whose signature they were procuring that they were candidates, activists/supporters of the Alliance For Change, and that they are procuring these signatures as nominators for candidates of the Alliance For Change at the Local Government Elections 2018. Nandlall further contends that Judge erred and misdirected Himself in law in so far as he failed to appreciate the fundamental legal requirement that the persons who are required to sign a form in support of a candidate at the Local Government Elections are persons who are genuinely in support of the political party which that candidate represents and the candidate himself/herself and that the signature on that list is an expression and manifestation of that support. 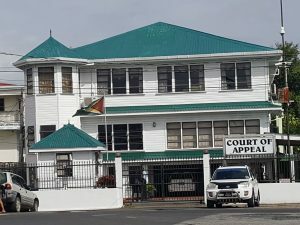 “The decision of the Learned Hearing Judge is not only erroneous in law but flies in the face of Article 147 of the Constitution of the Cooperative Republic of Guyana which guarantees to every citizen the right to support and associate with a political party of his/her choice,” said Nandlall. Nandlall did not rule out filing additional grounds when the written decision becomes available.